Like any long standing movement, there’s generally not one specific moment where all ideas are invented, but more a series of steps and standout points in time which culminate in a high point. This is the case with muscle cars where the golden years can be argued to be the late 60s and early 70s, but there were pivotal years over a few decades before which built to this high point. The full article is definitely worth a read. There is nothing like a first-hand account of what makes, models and engines were used at the time and in this case, how they fared on the track. Heavy cars with big, heavy, powerful engines were the order of the day. 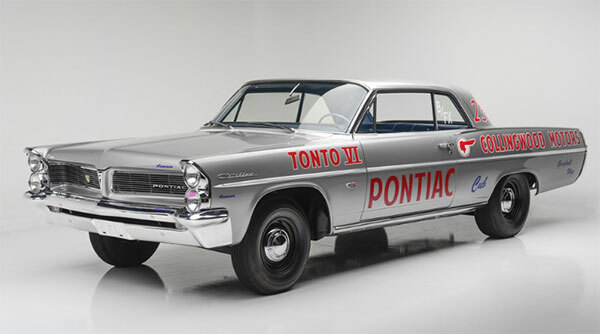 by 1964, the fashion was more mid-sized vehicles, ‘Led by the ’64 Pontiac GTO, the Chevy Chevelle and Ford Fairlane.’ The other great standout quote is, ‘ the year 1962 sticks out like no other as the year you could walk into your dealer, plunk down the cash and drive out with a 13-second super stocker you could race that evening.’ Raw, cubic inch power was the state-of-the-art for the times and still very accessible to the average guy. If you want a more general overview of the muscle car era, then you can delve into the two books below, which are previewed on Google books to get back history on the muscle car era. It’s always a good idea to get information from a bunch of sources, as you will always find slightly different accounts of what happened when and to whom. In this book, Motion Performance: Tales of a Muscle Car Builder, page 15 states how small, niche car makers of the 1950’s designed many prototypes, examples like the Bocar(Corvette powered) and the Kaiser Darrin. Lots of innovation and creativity when the automobile platform was still simple enough to make wildly different creations. Some of these creations inspired the biggest carmakers, which led to some of the classics we have today. The book American Muscle Cars: A Full-Throttle History, describe some of the early years of the muscle car and some of the pivotal years. Some standout vehicles of 1962 include the Chevrolet Corvair Monza Spyder, Chevrolet Corvette C1, 1962 Plymouth Sport Fury, 1962 Ford Fairlane, 1962 Oldsmobile F-85 Jetfire, 1962 Pontiac Grand Prix and 1962 Studebaker Hawk Gran Turismo. A 1962 Pontiac Super Duty 421 which easily had 450HP may seem very basic by today’s standards, but you’re talking about engineering that is over 50 years old and even now the horsepower rating is impressive, as is the beautiful contours of design, based more on an aesthetic than a computer-generated readout. Looking at the car designs today, seems more like automotive artwork than purely functional design. Couple this with great horsepower and you really couldn’t ask more for your money.